Removing and changing protective components is simple and straight forward. The procedure itself can be done in the field AND TAKES ONLY MINUTES (easy opening zipper). GADZOOKS, THIS ARMOR IS REUSABLE! Impact Safe-T Armor is effective and reusable! 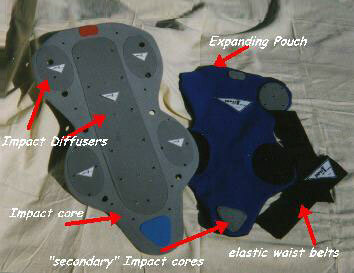 The Expanding Pouch and it's impact deceleration control components return to their original state upon succession of outside impact inertia. Disassembly of the Expanding Pouch, and inspection of all protection components is recommended after each serious incident. Questionable protection components should always be returned to our factory for further inspection. LABORATORY TESTED COMPETITION PROVEN. THE FUTURE IS NOW!